This past weekend,I documented a few flagged birds at Pikes Beach on Long Island NY. 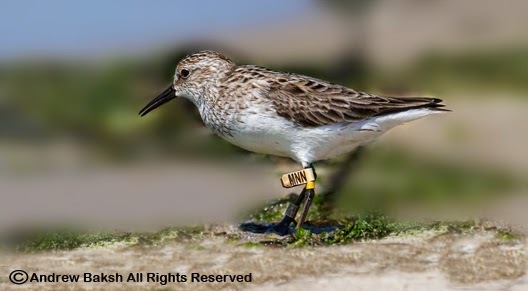 This bird, a Semipalmated Sandpiper, was a tough one to read the band information and it took me well over 40 minutes before I got within range to able to read and then capture a decent photo. The band data along with my field observation notes will be submitted to the Bird Banding Laboratory for more information and as soon as I have the history, I will post an update. Well this post answers several questions that I asked on a previous post. What dedication you have! It's great that you submit the band data AND any observations you make! I know that banders are very thankful for those who take the time to help them track the movement of birds.